1. Sola- This was just amazing. I got into it mid-season, but needed to marathon 6 episodes all in one day, because after just one I was hooked. Great characters, great story, great plot twists. 2. El Cazador- A worthy successor to Noir and Madlax. Turned out to be a lot of fun to watch, if only because it had memorable, likable characters. 3. Spider Riders ~Yomigaeru Taiyou~- So it’s weak compared to the first half, but it did have episode 23/49 in it, which was kind of life-fulfilling to me as a Buguese/Aqune fanatic. Runner up- Clannad- I’m loving this so far. Hopefully it gets even better when it returns. 1. LA (EL Cazador)- I’m a fan of stalker characters (as can be seen by the fact that Kisa from Eikyuu Alice Rondo won for last years best female) so obviously I fell for LA right away. He’s a blast to watch, and I loved the fittingly creepy voice Mamoru Miyano gave to him. 2. Takeshi (Sola)- Aside from he fact that he’s just plain hot, I love characters like him. He’s not really a bad guy, but was just trying to do what he thought would be best to help Mayuko. Takeshi/Mayuko also became one of my favorite couples of the year. 3. Soujirou (KyouSora)- The shower scene did it for me, but seriously, I like his attitude. He’s an awesome character to watch. Runner up- Rin (Shuffle Memories)- If I was in Shuffle, I’d join his harem. Then I’d likely have my head cut off by Kaede. 1. 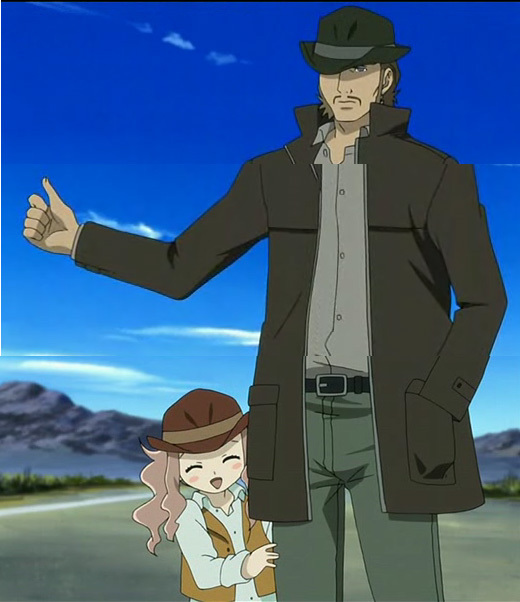 Lilio (El Cazador)- For one, she’s so adorable. The reason she’s number one is that she intrigued me a lot. Mysterious silent girls always get points in my book. 2. Alice (Bakugan Battle Brawlers)- Another mysterious girl. I have to say I was utterly shocked when her secret was finally revealed. 3. Miyamiya (Bamboo Blade)- And she makes the list because she shocked me in a different way. When she was introduced, she was this perfect sweet girl, whose only odd quirk was her taste in men. Then, all of a sudden, she’s a killer yandere. Runner up- Tarutotte (KyouSora)- I know a lot of people find her annoying as heck, but I really liked her (after the first episode anyway. Even then, I’ll agree she was annoying.) She was the least developed of the angels, but I love how it turns out that she really cared for Soujirou. 1. Hayate the Combat Butler- Admittedly, I didn’t watch too far into this, due to lack of time, but I still think it’s hillarious and I want to finish it some time. 2. Goushuushousama Ninomiya-kun- This was great. I was hoping for Girls bravo 2, which I didn’t get, but it had it’s own brand of entertainment. 3. Lucky Star- Another show i never got a chance to finish, but what I saw of it did amuse me, especially thanks to Konata. Runner up- Bamboo Blade- It usually makes me laugh a little, especially when Miyamiya and Dan are involved. 1. Euphoric field (ef- a tale of memories)- Love the song. The animation is pretty good too. 3. Daybreak’s Bell (Gundam 00 OP 1)- Mostly for the song, though the animation isn’t bad. Runner-up- Puchigiri Infinite Generation (Bakugan Battle Brawlers OP2)- It’s really exciting to watch, and fits much better than the first OP. 1. Romanesque (El Cazador)- The Friday Monday clone is cool. Too bad he never appears in the real show. Also, I like the song. 2. Proof (Hayate the Combat Butler)- Nice song and cute animation. 3.Hanamaru☆Sensation (Kodomo no Jikan)- It’s adorable, and I like the song too. Runner up- Dango Daikazoku (Clannad)- Dango… Dango… Dango… It’s so mesmerizing. 1- Beerain- Spider Riders ~Yomigaeru Taiyou~- “Wahh… Buguese… I’ve lost all hope in life… save me…” Okay, no. That about sums it up. She would be infinitely less annoying if there was at least some indication in the first half of the show that this was her true personality. 2- The cast- (Sketchbook ~full colorS~)- I think I may be scarred for life. Those stupid cats! 3- Any random kid from the early episodes (Bakugan Battle Brawlers)- I think they’re part of the reason the early episodes are so painful to watch. Runner up- The cast (Maple Story)- I couldn’t get through a whole episode. What is this? The “I can’t believe I didn’t drop this” award- Shuffle Memories- This was just a recap show. Need I say more? The “Pleasant Surprise” award- Hitohira- I liked it enough to marathon it in one day. Now there’s a surprise. The “Surprisingly Bad” award- Mahou Shoujo Lyrical Nanoha StrikerS- The first season was great and the second was amazing. What happened? The “Deserves another season” award- Sola- The ending practically screamed for it. What happened to Matsuri and Yorito? The “surprisingly likable character” award- Mirei (Hitohira)- Considering I couldn’t stand her at first, I’m surprised she turned out to be one of my favorites. The “Koichi Aizawa Memorial- best psychopath” award- Kazuya (KyouSora)- He was just nuts. He even killed Mika, who was also really crazy. Best Start- Sola- The ending of the first episode is a great hook. Best Finale- Pretty Cure Splash Star- The fights against Akudaikaan and Gooyan are amazing. I don’t even like fighting anime and I thought so. I wish the whole show could’ve been that epic.